The Secret of Flirting, the fifth and final book in Sabrina Jeffries' The Sinful Suitors series will be released March 27. 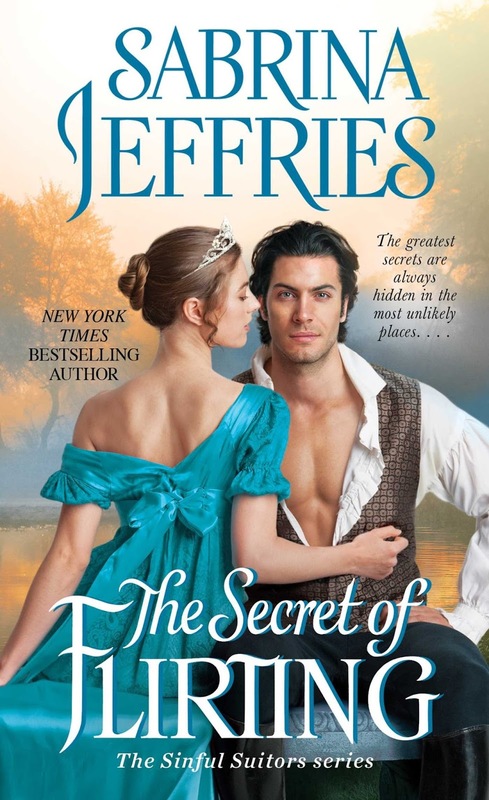 This has been one of my favorite series by Jeffries and while I'm sad for it to come to an end, I'm also excited for this next release. I'm intrigued by spymaster Baron Fulkham, especially after reading book 4, The Pleasures of Passion, and can't wait to finally read Fulkham's story in this new historical romance by one of my favorite authors. And let's talk about that cover for a minute. Don't you want to know what she's whispering in his ear? Those colors are simply gorgeous. And speaking of gorgeous, how about Fulkham? Am I the only one drooling on my keyboard? Update: I started reading an ARC of The Secret of Flirting last night. I finished at 2:00 this morning. What a wonderful send-off for this series. I loved it! When they reached the garden, Monique’s heart sank to see it so deserted. Apparently she hadn’t been the only one to think dinner might soon be served. Even the band they’d heard playing out here earlier had packed up and moved inside, closer to the banqueting room. You can handle this, she told herself. You’re an acclaimed actress, for God’s sake. This is what you do—play roles. Why, you’ve even played a princess before. So get to it, and show this pompous gentleman what you’re made of. “I hope not. It would make it awfully hard to eat,” he quipped. “And you are very . . . different,” he said. She had no idea if Anne was haughty. Though it would stand to reason. Weren’t all princesses haughty? Not the way Monique played them. And it didn’t matter how Anne really was. According to the count, no one outside Chanay had ever met the princess, so Lord Fulkham couldn’t be sure what she was like. He was merely trying to catch the woman he had met in an error. Which meant she must be as different from Monique Servais as possible, to throw him off guard, make him doubt his eyes. Monique Servais had given him the sharper side of her tongue, so Princess Anne must be engaging, flirtatious. “A man like you should know better than to listen to rumor,” she told him. Curse the fellow, he’d heard no such thing. He was just baiting her again. Readers, do you enjoy plays, operas, or musicals? Do you have a favorite? Have you read any of the books in Sabrina Jeffries' The Sinful Suitors series? I always love Sabrina's books & series. I only read the first book in series so far. But now that I'm over the flu I will be going back to it. I have listened to the 3 Tenors and Pavarotti but have never been to an Opera. I love all of Sabrina's books. I haven't read this series yet but they are on my TBR list. I love musicals. My favorite is Hamilton which I have seen twice. I've enjoyed her stories but have not read this series as yet. I'm not sure I have a favorite but I remember The Sound of Music - I think I say it at the movies 3 or 4 times!!! Sorry - that was "saw it at the movies"
I loved Phantom of the Opera, which gave me chills. Spies, love, intrigue, sizzling chemistry and romance are what I adore in a good historical romance. I have read some of Sabrina's books and enjoyed them. I haven't read this author, but I enjoy plays and musicals. In the last few years, I've seen the musicals, Wicked and Beautiful. As for opera, I don't enjoy listening to opera, yet I like them as a setting in a romance novels. I love Sabrina's books, but haven't started this series yet. I enjoy plays and musicals when something good comes on. I can't think of a favorite right now, unless it would be Sound of Music and River Dance. I never miss a Sabrina Jeffries book. I am looking forward to The Secret of Flirting. I like some plays, some operas, some musicals. I do love the theater and musicals - sadly I haven't been in years. I really don't have a favorite either. As far as the Sinful Suiters series goes, I haven't read them yet, but do own several of the books. I love musicals - my favorite is 'Seven Brides for Seven Brothers' - I like a happy ending. I love a good musical, it can be a movie or play. My favorite muscial movie would be Sound of Music and my favorite play would have to be Phatom of the Opera. 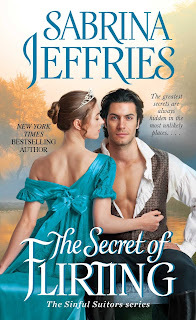 I have read this entire series by Ms. Jeffries and can't wait for this book! I used to keep up with all of Sabrina Jeffries' books, but I'm way behind on this series. Thanks for the post and giveaway. I have read many of Sabrina Jeffries books. Love them all. I haven't got to the sinful suitors yet. Looking forward to this next book in the series. And I love plays, opera, and musicals! I love musicals and plays and concerts and the whole thing. I was fortunate enough to read this book and I think it is one of the best in the series....but I love her books and I always think the one I just read was the best one. Please do not put my name in the pot to win the book. I loved the conversations between the Monique and Lord Fulkham ....they are both so bright and funny. I haven't read this series, but it sounds really good. I've read all of Sabrina's books including all of the books in this series so far. Don't cry to hard...she has a novella coming in July that will finally end this series. It's titled The Risk of Rogues. I didn't not just read this excerpt...I want to wait until I get the book in hand to read it all right then. Now for your question: I love the musicals from the 40's and 50's. That's when Hollywood really knew how to produce a musical film. Anything they try to do now doesn't hold a candle to West Side Story or Holiday Inn. I've read books from other series by Sabrina but have not read any in this one. Thank you for sharing the excerpt. I have read the rest of this series. Sabrina Jeffries is one of my favorite authors. I was lucky enough to meet her a year ago and she is so sweet in person. I love plays and musicals. I am not a big fan of opera. I was fortunate growing up to be able to go to several Broadway musicals. Don't go to as many plays or musicals now. Chorus Line is one of my favorite musicals. Spamalot, The Producers, Singin’ in the Rain, Wicked are tops but I really love musicals- stage and screen. I’ve read all of Sabrina’s books. I love musicals but have never been to the opera. I have yet to read any in her new series, sad, very sad. I love musicals, serious plays, and would love to attend Verdi's opera Aida. It is a spectacular production if staged completely. I have attended Phantom of the Opera, Cats, Seven Brides for Seven Brothers, Hairspray, Grease, and several others.